Add a single gate (4' to 5' wide) to any of the styles above. Add a double gate (8' to 10' wide) to any of the styles above. Pricing based on 150 linear foot installation. 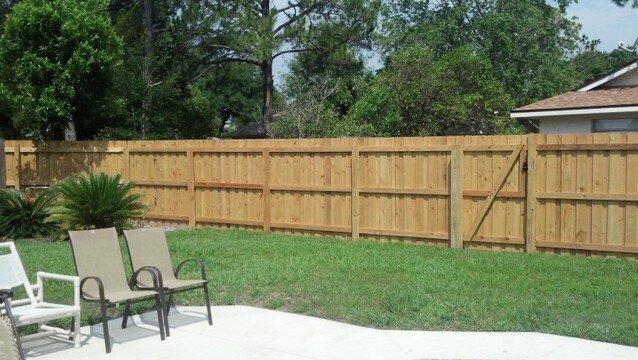 All wood fences have a #2 pressure treated pine frame with either pine or cypress pickets. All posts are set in wet concrete to assure a solid anchor. Nails are hot dipped galvanized ring shank to prevent rust, streaking and nails puilling out. We site build all of our wood fencing. This means that we come out the first day and set the posts, then come back the following day and nail the fence up board by board. This type of installation is the standard in Tennessee, where I am from, and I prefer to install what I know. And what lasts. Posts are set 30 inches in the ground and anchored with concrete. We do dry pack concrete on posts on smaller jobs, but we prefer to wet set whenever possible. Fences are site built. We build it from the ground up, board by board. Hot dipped, galvanized, ring shank nails. Three hinges per gate leaf. Double sided slide lockable Max-latch from Ameristar Fence Products, Inc.
We use MCA pressure treat pine with a weather protector already applied for 99% of our installations. The only other thing we use, in some cases, is a cypress picket. But only when required by the HOA or homeowner. I prefer to use the larger 5/8" x 5-1/2" pine pickets beacuse they are thicker and stronger and will last longer. We use full 2"x4" rails, not 2"x3" rails. And our 4"x4" posts are designed to be installed below ground. We custom build many different styles including stockade privacy, board on board privacy, shadowbox semi-privacy, and picket fencing. Any of the privacy or picket styles can also be spruced up with a cap or an arch or scallop cut. Or maybe a pergola over the gate.